“Tales of Clamor” is daring examination of redress era in intimate setting. In the first moment of “Tales of Clamor,” Kennedy Kabasares, dressed as a Japanese immigrant, clambers up two cloth silks. Suspended in air, he rises and falls, over and over, as government agents try to pull him down. There are moments of grace and peril, noise and quiet, and catharsis in the production at the Aratani Black Box, the inaugural show for this intimate setting. Just walking through the backstage area to the seating is a new experience. The audience, limited to 80 per performance, is onstage with the performers, who play multiple roles. A trapeze, aerial silks, as well as other acrobatic equipment are utilized throughout the show. Eddy, an aerial specialist, is only convinced to collaborate on the play if the more earthbound Kem will agree to literally walk the tightrope. We are now more than 30 years removed from the passage of the Civil Liberties Act of 1988. Kiriyama, who is the principal author, looks back at the time when redress was far from certain, and much of the Japanese American community was reluctant to speak about what happened during World War II. “Tales of Clamor” feels like a bookend to last year’s successful run of “Allegiance,” also at the Aratani, and I would encourage those who saw that production to give this one a look. While “Allegiance” was big and Broadway-friendly, “Tales of Clamor” is experimental. Camp is the through line that defines the Japanese American community, with works of art to help interpret and define the essential meanings of that tragic, and for many, deeply personal history. 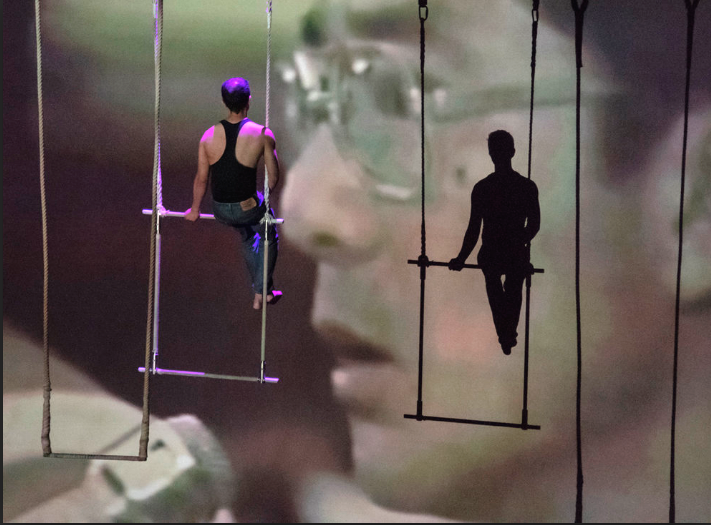 Kennedy Kabasares on the trapeze with testimony by the late Yuji Ichioka projected on the screen. For folks in the JA community, names and images will be familiar. Afterwards, I took out my copy of Bill Hosokawa’s “Nisei: The Quiet Americans” to look up a specific page mentioned in the play. At another moment, a cast member as a Rafu Shimpo tucked under her arm. 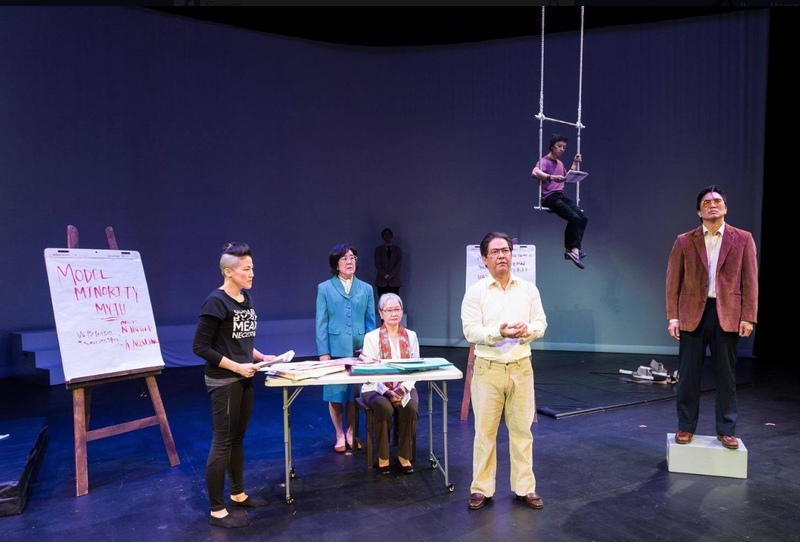 “Tales of Clamor” moves back and forth from Kem and Eddy exploring themes of the Asian American experience, such as the Model Minority myth, to a specific moment in JA history. In 1981, incarcerees spoke out, many for the first time, at the Commission on Wartime Relocation and Internment of Civilians (CWRIC) hearings across the country. The ensemble cast portrays the relations between young Sansei members of Nikkei for Civil Rights and Redress and Nisei camp survivors, who are reluctant to share their stories. Most poignant is the performance of Takayo Fischer as an elderly camp survivor. At a brief talk after the show, Fischer, who was interned at Jerome and Arkansas, said she feels an urgency to share these stories with her own family. What may be best about “Tales of Clamor” are the conversations that will happen afterwards. Did your parents or grandparents ever share stories about camp? Did you ever tell your kids about your camp experience or write down what happened to you? “Tales of Clamor” is experimental and daring in a way that is refreshing. I think it could benefit from some editing or streamlining. At 90 minutes without intermission, it feels a bit long. But thanks to the team that brought this production together, it presents the CWRIC testimony as a moment of catharsis for an entire community. Although he is unnamed, UCLA Prof. Yuji Ichioka, in his familiar, clipped cadence, is seen testifying in video projected on a large backdrop. I was a UCLA undergrad in Ichioka’s class back in the 80’s. At that time, he told us that redress was a longshot at best.